Fantasy is a full time job. Roberta Trahan is the bestselling author of The Dream Stewards, an epic fantasy series, and the science-fiction thriller Aftershock. She's worked in publishing and marketing for a long time, even holding a degree in journalism. 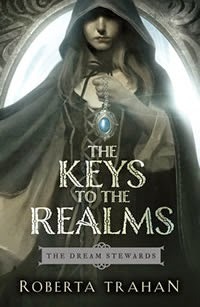 Her most recent release, The Keys to the Realms, is the sequel to The Well of Tears, the first installment in The Dream Stewards series. Roberta visited with Writing Belle today to let us into her world of writing fantasy and science fiction. Welcome to Writing Belle! Introduce yourself to my readers. Hello everyone! What a pleasure to be hanging out here at Writing Belle. 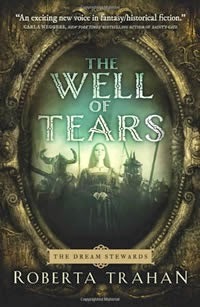 My name is Roberta Trahan, and I am the best-selling author of a quasi-historical epic fantasy series called The Dream Stewards (The Well of Tears, The Keys to the Realms). I also write dystopian SF and contemporary epic fantasy. Tell me about The Dream Stewards. The Dream Stewards is a classic fantasy series set in a historical setting and centered around the rise to power and long reign of a real-life king. Think Arthurian legend, only about 500 years later. The stories take place in ancient Wales, in a mystical forest that also actually exists. But that's pretty much where the reality ends. The Stewards are an ancient order of sorcerers who are dedicated to one purpose - ensuring the legacy of the king who has been prophesied to bring lasting peace to a war-ravaged nation. The Stewards themselves are struggling to survive, and their only hope is in seeing this prophecy come to pass. The sorcerers must not only protect the king-to-be against the worldly enemies who oppose him, but also the magical powers from within their own order that seek to supplant him. How did you get started writing fantasy? The very first story I ever wrote was a SF piece - I guess my fascination with science fiction and fantasy is inborn. I don't know any other way to explain it. I have an obsession with all things supernatural - and a burning determination to figure out how magical things might in all actuality be real. This is why science fiction appeals to me - its the intersection where fact and fantasy meet. I started writing fantasy because of Mary Stewart's iconic Merlin Trilogy. A local librarian turned me on to those books in the 80s, and I fell down the rabbit hole. I've never looked back. Briefly give us the plot of your short apocalyptic novel, Aftershock. Imagine a seismic event of apocalyptic proportions – a natural disaster so devastating there is no point in planning for how to survive, only how to stay alive if you do survive. And then, imagine discovering that there is nothing at all natural about it. In the aftermath of a massive earthquake, climatologist Daria Black finds herself stranded in an isolated mountain pass with a group of random strangers. With their surroundings growing more hostile by the minute and no way to call for help, the frantic survivors begin to clash over how to save themselves. Then Daria discovers the seismic event that destroyed their lives was not what it seems. Something else is reshaping their world. Fighting grief and guilt, Daria must find the will to fight - but first she must decide who to follow, when to lead, and how to stay alive. 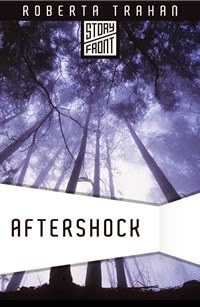 Essentially, AFTERSHOCK is a post-apocalyptic first-contact sci-fi action-adventure novella set in the Pacific Northwest. How did you become a writer? What did the journey to publication look like for you? I know lots of writers say "I've always been a writer", but for me, that's really true. I wrote my first short story in third grade, and for whatever reason, that piece earned me a reputation for having a way with words. As a teenager, I won a handful of poetry and essay contests and was published nationally in a couple of magazines. I then went on to study Journalism and Advertising in college. I worked as a copywriter for years but didn't begin writing fiction until about 15 years ago, when my husband dared me to write a book. For me, the journey to publication was basically a long, steep learning curve. Although I seem to have a way with words, storytelling was something I had to work very hard to master. I'm still working on that. But it took about ten years of re-writes, craft classes, conferences, and studying at the feet of successful authors and editors before I got my first book deal. It was an incredibly difficult process - a lot like going back to college to learn a whole new career. But I'd do it all again, in a heart beat! Well, I'll tell you my *least* favorite part - plotting. In the early stages of a new book, I spend several weeks mulling the basic concept over in my head, twisting and tweaking the major plot points until they fall into place. This is the most frustrating part of my process, but I can't seem to figure out how to do it any other way. My favorite part about writing is creating a fictional landscape - in fantasy fiction, world building is everything. Creating an entirely original culture, society, and geography is the most freeing thing I know - it allows me to let my imagination run rampant, and I love that. What kind of research have you done for your novels? I am a science geek and history nerd at heart - I have an insatiable sense of curiosity. I tend to enjoy learning about things as much as I like writing about them, so I do extensive research for all of my books - especially the Dream Stewards series, which takes place in a historical setting. In the beginning, the internet was new and there weren't very many academic resources available online. So when I first started researching my novels, I did it the old-fashioned way - I went to libraries and bookstores and collected as many books on medieval history, Celtic mythology and early medieval politics and geography as I could find. But the internet was very helpful in connecting me with experts around the world who were able and willing to share their knowledge. That was probably the biggest breakthrough for me - being able to correspond with scholars and historians and other writers. For AFTERSHOCK, I spent about six months researching earthquakes and the potential devastation of a 10.0 seismic event. This type of earthquake is a very real threat, especially in the Pacific Northwest, where I live. I talked to seismologists at the University of Washington, read a number of government geology reports, and studied survival tactics. Like I said, I like the learning as much as the writing - so research is fun for me. I always end up with more than I need, but I know a lot of interesting things! Wow - that's a bit like opening Pandora's box :). There are so many important tips to pass on, but I guess my best advice for aspiring authors would be to spend as much time developing your knowledge of the publishing industry as you do honing your writing skills. Mastering your craft is essential, but if you want to be published, understanding the book business and how it works is too. Find the publishing path that makes the most sense to you, and learn everything you can about it. Success as an author depends as much upon your business savvy as it does your creative talent. Roberta Trahan is the bestselling author of THE DREAM STEWARDS epic fantasy series and the SciFi novella AFTERSHOCK. Her lifelong love of speculative fiction began at an early age, when a certain star-trekking television series inspired an alien-encounter essay that both shocked and horrified her third-grade teacher. 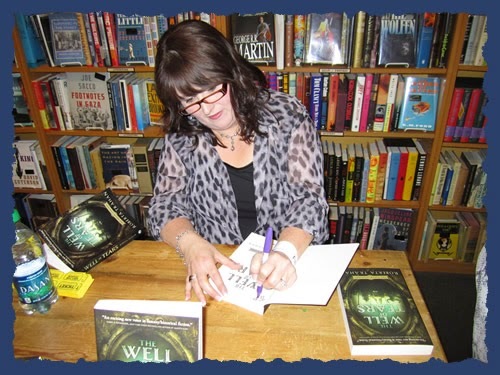 First published nationally as a teenager, Roberta went on to earn a degree in journalism and advertising at the University of Oregon and then worked in various sales, publicity, and marketing positions before eventually turning to creative writing as a career. Roberta credits the work of classical masters like J.R.R. Tolkein, Marion Zimmer- Bradley and Mary Stewart with igniting her love of fantasy, folklore and history. But it is her own Celtic heritage that she claims as her muse. She blames a rogue alien genetic marker for her chronic addiction to caffeinated substances and her compulsion to invent imaginary worlds. She is also enamored with hummingbirds, and easily distracted by small, shiny objects. A Pacific Northwest native, Roberta currently resides with her family in the Seattle area and is actively involved with her local writing community as an instructor and speaker. Roberta's books are available on Amazon, Barnes & Noble, Powell's City of Books and The Book Depository.